Marvel announced a ton of movies yesterday, revealing the characters who'll be joining their silver-screen universe over the next five years. Some of the new heroes, however, aren't as well-known as big-leaguers like Iron Man, Thor and the Hulk. 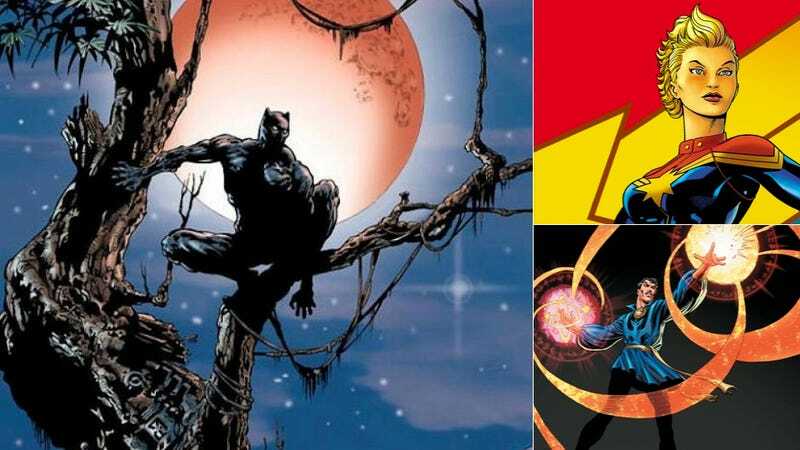 If you don't know who Captain Marvel, Black Panther and the Inhumans are, we've got a reading list that will help you learn. Marvel's Phase 3 movies will be introducing a crop of characters that won't be as recognizable as, say, Captain America was before his first movie. But they've still got decades of publishing history behind them. At this point, there's no way to know what comics storylines will be informing the next wave of Marvel movies. But the comics below should help impart—or re-kindle—a sense of what to expect from the upcoming films. The introduction of the Black Panther sets down a great foundation for what, I think, are the best interpretations of the character. Costumed monarch T'Challa invites the Fantastic Four to his homeland of Wakanda and proceeds to defeat then in combat to test his own mettle. He's a ruler of a nation, one who as methods and motives that can be opaque and unavailable to other crime-fighters. He can either sneak around or make a speech at the U.N. to accomplish his goals. A classic storyline from the 1970s that had T'Challa trying to thwart a takeover of Wakanda. It's a long, involved narrative that introduces lots of supporting characters, enemies and points-of-view. You get the sense that Wakanda is made up of people from all sorts of walks of life and that T'Challa's true struggle isn't just against would-be world conquerors. He also has to maintain the legacy laid down by the previous Black Panther kings who preceded him. My favorite interpretation of the Black Panther starts here and builds off the idea that he's just a black guy who stood around in the back of Avengers group photos. Writer Christopher J. Priest revives the Panther who's a strategist with resources other heroes only dream of. His tenure also has some of the funniest dialogue ever done in superhero comics. Told years apart, these Panther story arcs are political thrillers set in the Marvel Universe, pitting T'Challa against his Avengers teammates and the U.S. government. The Enemy of the State stories showcase the range of stories that the Black Panther can comfortably fit inside of. Carol Danvers' first turn as a superhero came after getting caught in the blast of an alien superweapon, while trying to help an extraterrestrial soldier named Mar-Vell. When she got her own book in the 1970s, female-led series were an extremely rare thing. This issue happens while the X-Men were in space fighting the Brood, creepy aliens who were implanting eggs inside of human hosts. Carol Danvers had lost her powers but wound up becoming imbued with cosmic energy during her time in space. The newest era of Carol Danvers' superhero career has been charted by Kelly Sue DeConnick, along with a bunch of highly talented artists. DeConnick takes Carol back in time in this storyline, first to World War II and then to her own origin story. Along the way, she gives the character just the right mix of determination, vulnerability and high-stakes drama. She's become a major player who bridges the gap between Earth and outer space, providing a relatable human viewpoint throughout. The earliest appearances of Stephen Strange introduce an arrogant surgeon who loses his ability to operate after a car accident. The search for a cure leads him into the realms of magic, and he soon becomes Earth's Sorcerer Supreme. The first stories featuring the character were amazingly imaginative psychedelic excursions drawn by comics legend Steve Ditko. It'll be great if the movie channels some of the trippy energy in these stories. For years, Dr. Strange was a weird guy who wiggled his fingers through stories that either belonged more to other heroes or the villains he was fighting. But a great run of stories by Roger Stern and Paul Smith in the '80s made him feel more layered and human than ever before. A magical superhero is easy to portray as almost unbeatable, which is why the best part of this story is Dr. Strange being mortally wounded. He's trying to save his friend/manservant from a deadly disease but is near death's door himself. Like Stern and Smith before them, Brian K. Vaughan and Marcos Martin infuse their version of Stephen Strange's world with more humor and genuine human connection than the typically-aloof character usually enjoys. Marvel's had a non-team of heroes called The Defenders for a long time, with Dr. Strange almost always at the center of the loose conglomeration's core. The iteration of the group from a few years back delivered an excellent mix of personality-conflict tension and weird alternate reality scenarios for a quirkier-than-normal look at the Marvel Universe. The two movies that share the Avengers: Infinity War moniker are probably going to revolve around Thanos, a cosmic conqueror obsessed with death. In the crossover story from the '90s, he gets his hands on six cosmic gems that let him manipulate reality. It takes hundreds of heroes teaming up to try and stop him and even then they barely win. This might be why Marvel's bulking up their roster of characters, so as to recreate the spectacle of this story on the big screen. It seems very likely that the third Thor movie will be adapting the epic 1980s run of stories written and drawn by Walter Simonson. Collected here, the arc unspools a massive celestial war that destroys and scars nearly everything Thor cares about. Simonson's masterful work gives a panoramic scope to the gods and realms of Asgard and beyond but still makes the melodrama feel grounded and resonant. Like the Black Panther, these characters got their start in modern Marvel's first superhero comic. These issues frame the Inhumans as exotic outsiders, hinting at a society with customs and a caste system that's alien and eerily familiar at the same time. The versions of this genetic offshoot community written by current Marvel A-lister Jonathan Hickman put the FF in the middle of a long-brewing cosmic plot. The Inhumans work best when they're portrayed as only slightly related to mankind, being pulled towards the intergalactic drama that resulted in their altered DNA. Have comics recommendations of your own about these characters? Add them below. And if you're happy to read comics digitally, look for many of the above comics on Comixology (which displays comics on computers and mobile devices) or through Marvel's own digital comics service.